Low horsepower, low speed, it can save 50% power at least. Low noise. Special blade design, whose shredder blade life is 3 times longer than the general shredder in the market. Blow molding bottles, injection products, extrusion lump, sheet and pipe, woods, paper, thermoforming products, electronic supplies, rubber, metal... etc. 1. PET bottle breaking : Able to do shredding & label removing. To reduce the big space requirement due to batch process by large trommel, and reduce more than 50 % powder produced. 2. Pallet breaking : Directly shredding & crushing. Reduce the cost of crushing process. 3. Large drum breaking : Directly shredding & crushing. 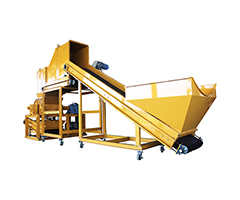 Reduce the cost of crushing process. 4. Wood breaking : Blade life is 3 times longer than general shredder. 5. Tire breaking : Blade life is 3 times longer than a general shredder. 6. Various kind of electronic products breaking : With slowly speed crushing, it reduces blade wear and unnecessary powders. Because there are too many small metals attached with electronic products ; With blades of precision alignment and angle arrangement, it reduces the problem on metal damaging the blades.